Despite the credit to Lonely Planet, this is unmistakeably (the flags caught mid-flap are the giveaway) my photo on this cover: fourth time this year, yay. Inside is a story about Wales. The castle is the one at Harlech, almost a cliche castle, and very impressive, especially the fact that in 1294 it was successfully defended against the entire Welsh army by just 37 Englishmen. There were five seiges here, one of them lasting 5 long years. We almost got castled out in Wales, we went to so many in such a short time - but still only a tiny fraction of the hundred-plus still standing. 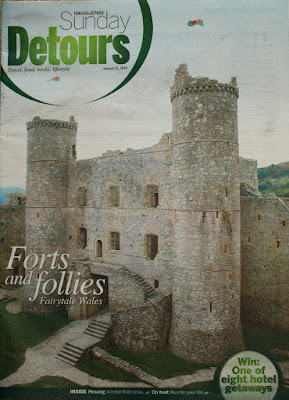 I do remember them individually, though - Raglan with the cat on the lawn and a commanding view of the A40; Abergavenny, in ruins and still bearing a grudge of betrayal from the thirteenth century; rotted-tooth castle stumps on hills around Llandovery; Harlech; stately Caernarfon where Prince Charles was invested, "the best castle in the world" according to the caretaker; and stripey Beaumaris on Anglesey, a triumph of design, the last and cleverest of Edward I's castles but not quite finished and never actually used.